Rush.com posted a press release and a trailer today (with a higher-res version of the cover art that I've replaced below). Rolling Stone posted an article about the release as well. 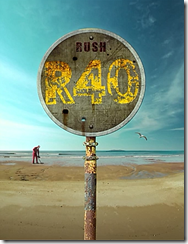 R40 is now available for pre-order on Amazon. An unreleased 1997 Test for Echo Molson Amphitheatre performance. Songs include: 1) Limelight 2) Half the World 3) Limbo 4) Virtuality 5) Nobody's Hero 6) Test for Echo 7) Leave That Thing Alone/Drum Solo 8) 2112 (all seven parts). 2014 marks the 40th anniversary of the release of Rush's eponymous debut album in 1974. This superb collector's box set brings together live performances by Rush from each decade of their career. It includes "Rush In Rio", "R30", "Snakes & Arrows Live", "Time Machine 2011: Live In Cleveland" and "Clockwork Angels Tour" plus a bonus disc of previously unseen live material stretching from 1974 to 2013. Rush are renowned for the energy and excitement of their live concerts and this set brings together some of their finest performances. The 6 Blu-ray discs are contained in a stunning 56 page hardback book measuring 305mm x 225mm with the 6 discs contained in 5 additional rigid insert pages. The 56 pages of the book are filled with memorabilia and photographs documenting 40 years of Rush live in concert. This is the ultimate collection of Rush live performances, beautifully presented. See attached sheets for details of bonus features on each set. The ultimate set of Rush live concerts on Blu-ray. Includes "Rush In Rio" on Blu-ray for the first time. Fantastic presentation making R40 the must-have item for any serious Rush collector. Bonus disc contains the rarely performed full 7-part version of "2112" filmed in 1997 amidst over 3 hours of largely unseen material. Incredibly loyal Rush fanbase who are very strong buyers of live concerts. Running Time: 19hrs 7 mins approx. Outtakes from "The "Real" History Of Rush Episodes 2 & 17"
"Tom Sawyer" featuring the cast of "The "Real" History Of Rush Episode 17"